It’s only natural that a crazy news week would be capped off by an equally crazy set of new albums to take our minds off everything over the weekend. 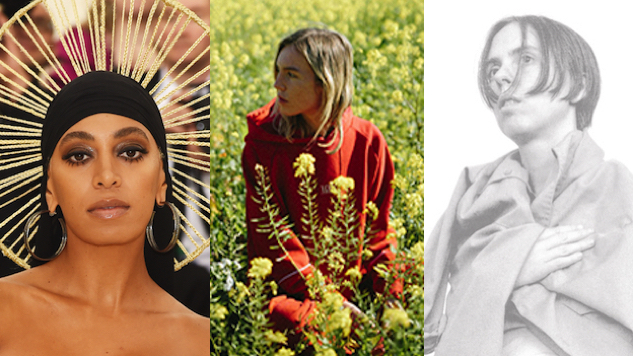 We’ve been looking forward to many of these albums, some of them for a long time, but others were total surprises and tipped the scales on the week from fairly standard to positively overwhelming. But what are we here for, if not to sift through a daunting pile of releases and come up with a few solid recommendations for you all? Here are 10 essential albums to stream today, including some of Paste’s most-anticipated March releases. The guitarist born Steve Marion has built up quite the resume for himself with his run of excellent instrumental albums and guest spots for Yeasayer, Amen Dunes and Paul Simon. We last saw him on wax for The Christmas Album in 2018, and now he’s back in the spotlight again with 35 minutes of baroque, proggy vignettes titled Till I Burn Up. English musician Amber Bain is back with the first full-length album from her indie-pop project The Japanese House. Good at Falling is a sprawling, candid confessional that finds Bain reeling from a breakup. It was produced by George Daniel, the drummer for Bain’s labelmates The 1975, and the resulting sound is a breath of fresh air that still stays true to the lush, youthful energy of Bain’s early work. Winnipeg shoegazers Living Hour have released their second full-length album, Softer Faces. The five-piece’s latest effort sounds like they’re reaching upward and outward. Their guitars are getting gauzier and their choruses are soaring higher with every song. Fans of Cocteau Twins might find an heir apparent in Living Hour if they keep heading in this direction. The eighth album from Australian group Pond is a vivid, technicolor pop departure from the blissed-out psych of their past. It finds the Tame Impala-adjacent project exploring the melodic path of least resistance for the first time in their career, often with immensely satisfying results. Between its fresh pop trajectory, Kevin Parker production and frontman Nick Allbrook’s newfound lyrical fervor, you really can’t go wrong with Tasmania. The triumphant return of Jennifer Herrema and Neil Hagerty’s Royal Trux has begun in earnest with White Stuff. The pair put out a live album last year, but White Stuff is their first collection of brand new material since Pound for Pound in 2000. Rest assured, Royal Trux still sound like if Dinosaur Jr. got really into Southern rock, and they also still totally rule. Solange Knowles has finally followed up her now-classic 2016 album A Seat at the Table. When I Get Home arrives with a psychedelic and experimental new sound, and an impressive list of contributors, including Earl Sweatshirt, Tyler, the Creator, Panda Bear, Pharrell, Blood Orange, Standing on the Corner and many more. There’s a lot to unpack here, with Solange fitting 19 tracks of heady, adventurous R&B into a concise 39-minute package. Former Red House Painters songwriter Mark Kozelek has had a wildly productive few years as Sun Kil Moon. I Also Want to Die in New Orleans is already his fifth album since 2016, and it finds him just as idiosyncratic and fascinating as ever. Kozelek collaborated on the album with Grammy-nominated sax player Donny McCaslin and Jim White of the band Dirty Three. He reportedly came up with the name after seeing a poster for the $uicideboy$ album I Want to Die in New Orleans. Montreal artist Yves Jarvis, formerly known as Un Blonde, has released a restless, eclectic collection of songs called The Same But By Different Means. The album’s 22 tracks vary in length from 15 seconds to over eight minutes, and move seamlessly between experimental R&B, lo-fi hip-hop and spaced-out psych. Yves Jarvis is set to hit the road with Homeshake later this month.